German picture dictionary is a dictionary of useful pictures when traveling, in everyday situations and for education. It is more extensive than most printed versions. With 800+ color photos of everyday objects, food, and symbols for accommodations, activities and services, German Picture Dictionary is a perfect travel companion when visiting German speaking countries and you don’t speak the language – and nobody understands yours. 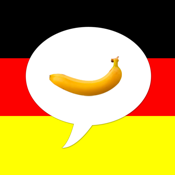 The app also helps when learning German vocabulary. 800+ pictures in 12 Categories with sub-categories for faster and easier navigation. Smart extra features to ask for prices or the time, and the possibility to use the camera to add pictures of your own makes this application a powerful tool that will solve many small problems and give you more time to enjoy your trip. Translates to German from 12 languages: English, Russian, Chinese Traditional and Simplified, Korean, Japanese, German, Portuguese, Arabic, Swedish, Italian and Spanish. Use the ”Negotiator” to discuss prices and the clock to talk about time. Use your iPhone camera to build your own library of pictures for your special interests, the address to your hotel or objects you often buy. Tourists, Back-packers, Business travelers, expats, teachers, language learners.